Here’s a great snack that even a child can help prepare - Suzy Wongs. Now, no offense to all ladies named "Suzy Wong" but that's just how they call it here. I don't know if I even got the name right, coz some call it Sosy Wong. But still, this snack is so yummy and goes well with mayo and catsup for dip. So, here's cooking... Suzy Wong! What to do when it starts to drizzle? And your outdoor stove is, erm, outdoor under a tree? Surely, you don’t want whatever you’re cooking to get wet, right? Well the simplest way is to use an umbrella. Since the stove is under the branches, you could just let the umbrella hang from among them. The picture below shows how. Have you ever had finicky kids who wouldn’t touch vegetables, especially nutrient-rich spinach? Well, it’s probly how you prepare it. Remember, not all kids are like Popeye who could eat spinach straight from the can! So how can you prepare flavorful spinach? Add skinless longganisa! (Filipino sweet sausages). Use a light-grade sandpaper to lightly sand away rust, soot, and dirt that could’ve stuck to the tool. By doing those two, your tools and accessories will last much much longer. "Pandanus Amaryllifolius is a tropical plant in the screwpine genus which is known commonly as pandan and used widely in Southeast Asian cooking. It is an erect green plant with fan-shaped sprays of long, narrow, bladelike leaves and woody aerial roots. The plant is sterile, flowers only very rarely, and is propagated by cuttings." "The plant is rare in the wild but cultivated widely for use as a flavoring in cooking. The leaves are used fresh or wilted, and are commercially available in frozen form in Asian grocery stores in nations where the plant does not grow. They have a nutty, botanical fragrance which enhances the flavor of Indonesian, Filipino, Malaysian, Thai, Vietnamese and Burmese foods, especially rice dishes and cakes. The leaves are sometimes steeped in coconut milk, which is then added to the dish. They may be tied in a bunch and cooked with the food. They also may be woven into a basket which is used as a pot for cooking rice. Pandan chicken, or gai ob bai toey, is a Thai dish with chicken wrapped in pandan leaves and fried. The leaves are also used as a flavoring for desserts such as pandan cake and sweet beverages." "Cockroaches tend to dislike the smell of pandan leaves. In Asia, a car infested with cockroaches can generally be rid of the cockroaches by leaving a handful of fresh pandan leaves overnight in the vehicle." In a previous entry, I mentioned the Superkalan was also sold inside the mall coz it was smokeless. But is it really? Well, the answer is “yes” AND “no”. Yes, because once the fuel is dry and burning very hot, there is no water content to turn into steam that comprises the smoke. No, because when you are just starting the fire, there will always be smoke coming from firestarters like paper and dried leaves. And until the main wood fuel is very hot, expect the water content to turn into steam and smoke. Everytime I need to fire up the stove, I’d always need some pieces of scrap paper to light the tinder. Most of the time, I’d scrounge for old newspapers in the garage or scrap paper elsewhere. And most of the time also, I’d still have leftover scraps of newspaper after cooking which I conveniently misplace. 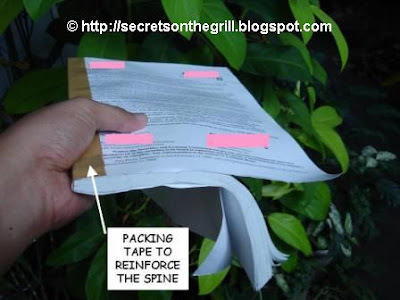 So I said, “Why not a convenient source to get your scrap paper for firestarting?” And then I thought of junk mail like booklets of old company financial statements, stockhoder reports or what have you. Rather than just throw them, I now used them to be my neat convenient source as shown below. In a previous article, I mentioned a soapy tip that will minimize the forming of soot and hence make cleaning a bit easier. Well, let’s step a bit further. Do note that soot will form. So how do you get rid of it? Steel wool, a plastic scrubber or a brush comes to mind. How about something you just pick from the backyard and quick throw away when done? Shown below is the Is-is plant also known as Alagasi (Leucosyke capitellata). Some call it Iis. It’s a plant that grows up to 10 feet or so. Here’s an entry for a cold day: Penguin barbecue (hmmm, yummy! ), lots of beer, cool sounds and great company. Burp! Here’s a basic recipe for cooking mouth watering “Paksiw na Tilapia”. This recipe is for 6 medium-sized Tilapia. Okay, I think I should’ve retitled this post as “How to Prevent Soot from forming on the Cooking Pot’s Bottom”. But then again soot is a natural annoying byproduct when you use wood fuel for cooking and is inevitable. This tip addresses what you can do so that soot that eventually forms can be easily removed. Before cooking, get some cheap liquid detergent. Coat the bottom and sides of the pot with the detergent. In the absence of a liquid detergent, you could use laundry soap, water and a piece of foam to produce some thick soap suds. Soak the foam and rub it on the soap and occasionally squeezing it. This will create a soapy solution which you can wipe on the sides of the pot as shown below. Get more of the thick soapy solution and apply liberally on the bottom of the cooking pot. You don’t need to let the coating dry. 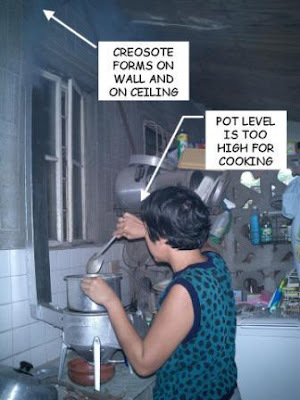 Just use the pot normally to cook. The detergent coating will burn and soot will form on it. This soot is then easily scrubbed off when washing the pot. Just remember to do the above steps every time you cook. 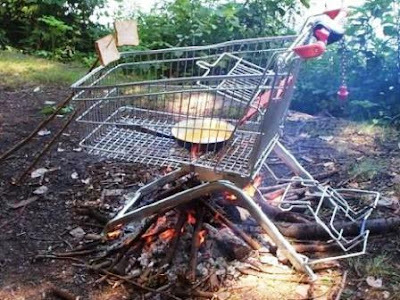 In a previous entry, someone commented that there’s an even cheaper way of getting a grill grate for free and pointed me to a funny picture shown below. In a previous article, I talked about how the old screen filter was so difficult to clean especially when the soot buildup had started to harden and clog the screen holes. In the same article, I described how a better filter can be made with simple common materials using household tools. Take out the dirty spider filter from the chimney extension. The old grill grate we have is old and rusty. Not only does it look bad, it can become unhygienic as well as dangerous to use and clean. I mean, look at those rusted, worn out thin rods. They look like deadly spikes! It’s certainly time to replace it but we don’t want to buy a new grill grate when an improvised grate would work as well. A devise that’s made of metal, flat, and has a grid of bars that are adequately spaced is really all you need. Remember, this is something that you’ll put on the fire so it need not be fancy but certainly has to be sturdy. Many Pinoys love to grill fish and typically, it’s the Tilapia that’s the fish of choice. Why? It’s cheap, readily available and relatively easier to grill. Sometimes though, the grilling goes to the worst like when the fish skin and flesh sticks to the grill grate and practically ruins the fish into an unrecognizable mess. Not only is the unfortunate fish torn and ruptured, it’s now as dry as a toasted piece of cardboard. And the taste is now similar to it too. When the grill (superkalan) was still new, we didn’t clean or inspect it regularly. Hey, it always worked well and it was new! So imagine one day when the smoke coming out of the chimney extension didn’t look right. By this, I mean the smoke just sort of lingered and drooped downwards rather than the usual rapid upward billowing. There was also more smoke than usual seeping out from the plates and the fuel feeder. In other words, there was too much smoke but not enough fire. Somehow I suspected that hot air just wasn’t pulling the smoke out of the chimney as easily and as quickly. We were just starting to cook for the grill and concluded there must be something blocking inside the chimney. With potholders and gloves in hand, I carefully detached the chimney extension from the chimney. Yup, there was so much soot clinging inside the walls of the chimney. Lo and behold, a leaf was resting inside the chimney all blackened and thick with soot. The inside was 80% blocked. No wonder there was smoke everywhere. There was nowhere else for the smoke to go. In a previous article, I wrote that the third and best reason to store away leftover charcoal was to use it as a fire enabler. The process below essentially describes how the chimney firestarter works although in this case, the grill body itself works as the chimney. Here are the steps to start the fire with the leftover charcoal. Since I don’t buy charcoal, the “charcoal” I say here refer to the pieces of charred firewood leftover from the last grilling or cooking. So you need to build a robust file quickly and start cooking in a few minutes. What, no dried leaves for starting the fire? But that’s one important component for building quick, no-cost fires. Wait, just how dry is “dry”? If you think any fallen leaveswould foot the bill, well, the answer is “no”. What you need are leaves that would pass what I call the “crush test”. In a previous article, removing the leftover charred fuel (now charcoal) from the grill was one way to stop the fire. Actually, you could’ve just left the remaining embers in the fuel bed and forgotten about it. In a safe location, the remaining fuel would just be consumed. It’s the lazy man’s way of slowly putting out the fire. First, storing them in a loosely covered tin can assures the safe containment of the fire. Secondly, these leftovers can be reused as fuel in your next cooking or grilling session. Thirdly, and probably the best reason for storing, is to use these as effective fire enablers for the next grilling. Charcoal, with enough heat catches fire far more easily than firewood. And so, with glowing live coals, there’s less probability for the fire to just die out. And if it does, well, you still have your trusty fan, don’t you? With a pair of tongs, get the bigger chunks that you can easily pick up. Be careful here. You don’t want to drop the hot coals on your feet or on anything that may burn. Put the big chunks inside an open tin can. A tin can with a lid for powdered infant milk is good. Close the tin can with its lid CAREFULLY. You could use the pair of tongs for this. 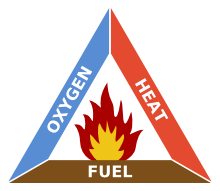 An analogy of the Fire Triangle is a Fire Tripod where all 3 legs are needed for the fire to “stand”. The way to end the fire is by removing one of the legs. Before, I’ve always been amazed at how some folks, typically those from the countryside, seemingly build fires effortlessly. It’s as if they do it all by instinct! Well, I suppose some parts of the process is learned through experience like knowing exactly when the fire “catches on” or when more elbow grease is needed for fanning; or when it’s timeto safely add more wood without killing the fire. Strip several pieces of paper and slightly crumple them. These crumpled pieces will form the first layer. Position dried leaves in a stack or pile so there’s plenty of air below. Don’t jam all leaves otherwise the fire suffocates due to lack of air. Position a few dried twigs or small branches on top of the heap. With a safety match, light a small piece of paper around 6 inches long and light the bottom layer made of crumpled paper. Fan the fire to create flames that engulf the dried leaves. A big blaze should ensue and this will burn the dried twigs or small branches. 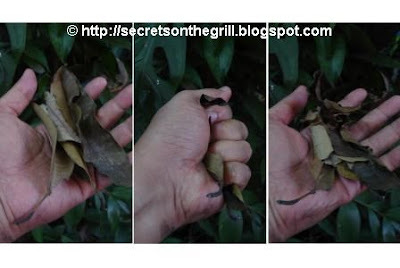 If the fire starts to die down, add more dried leaves and resume fanning. As the leaves and twigs get consumed by the fire, the heap collapses with its weight. The key here is to ensure that the branches don’t fall all over the place. An enclosed space (like the superkalan’s body) to contain the heap makes this easier. This is basically what a chimney firestarter does. Starting a fire with the above materials is fast and easy. You only need to get it going and then keep it going. Well, we knew that a wood stove (or a “multi-fuel” stove, for that matter) would still have some smoke somehow. So putting it indoors was out of the question. The nearest location we had for it was at the garage near our laundry area where the washing machine was. Immediately, the disadvantage of having it in a COVERED garage is when residue or creosote forms on the walls and the ceiling. It’s the yellow-brownish shiny residue that more likely will worsen the more we use the stove. 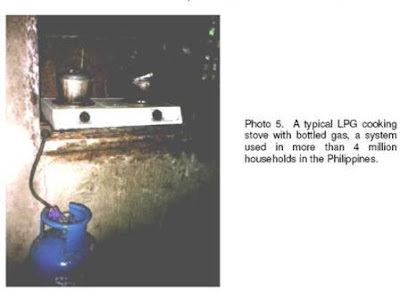 What is LPG? Well, simply put, it is Liquefied Petroleum Gas. The gas is encased in a metal cylinder or bottle. Here’s a picture of what it looks like. 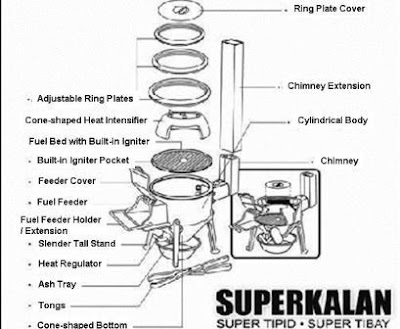 Thanx to the Superkalan website, I was able to get an exploded diagram of the Superkalan stove. I edited the labels of the stove parts to make them clearer and more readable. The unit as shown in the diagram comes with a pair of tongs also. This tool is very useful for moving coals around and picking up any hot items. The Superkalan: Is this a Grill or a Heater? Two years ago, the DH and I chanced upon an odd-looking gizmo that was on sale at Festival Mall in Alabang. You see, occasionally, the Exhibit Center would showcase products from different areas or provinces in the Philippines. And on that particular day in January, 2005, it was La Union’s time to shine. There were plenty of the usual: woodcrafts, tupig, woven blankets, etc. etc. Well, somewhere in the middle of the Exhibit Center a few people were milling 'round a stall that had this gizmo.